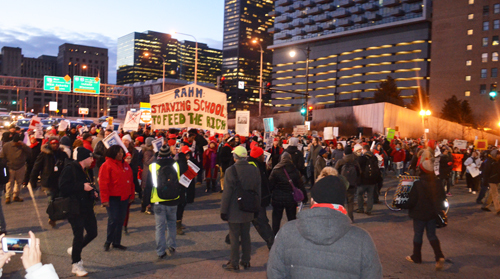 As hundreds of marchers blocked Chicago's Congress Expressway at Wells St. on February 4, 2016, one of the many banners proclaimed "Rahm Starving Schools to Feed the Rich!" 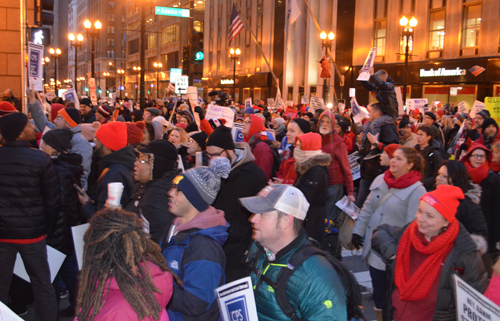 Substance photo by Sharon Schmidt.At least 2,000 and perhaps as many as 3,000 Chicago public school teachers and hundreds of their allies marched in defense of the city's public schools on February 4, 2016. The march included teachers, PSRPs, parents, students and community supporters of the Chicago Teachers Union. The march began with a rally in front of one of the Bank of America Loop buildings on S. LaSalle St. and wound through the downtown areas, including a blockage of Congress Expressway, before ending with a rally at the Picasso statue across from City Hall and the County Building. Subsequent estimates were as high as 5,000 (a group called "Fight Back"), while the CTU issued a press release saying the number was 3,000. The February 4, 2016 march, which was organized and led by the Chicago Teachers Union, included a growing band of militant students from many of the city's most prestigious high schools, Walter Payton, Lincoln Park, and Whitney Young among them. Some of the many more than 1,000 marchers who began the action in front of the Bank of America building at Adams and LaSalle were visible in this photograph, taken around five in the afternoon. A report on WTTW (Chicago's supposedly "public" TV station) claiming that only 300 people had showed up was obviously false, but, as Substance has noted for years, the report on Channel 11 was simply ruling class propaganda. The size of the event, which moved through the Loop and included a sit-down at Congress and Wells, blocking the Interstate, was never smaller than 1,000 people and was often much larger. Substance photo by Sharon Schmidt.Because people were arriving at the march and rallies at different times, it was difficult to get a "crowd count." At one point during the march, Debby Pope, one of the marshalls for the CTU, said "A friendly cop I was chatting with said about 3,000. I'll take it..." The proclamation by Chicago's "public" TV station, WTTW, that there were only 300 people at the action was definitely not true. The rallies and march also received support from a growing number of Chicago's principals [see lengthy statement by Troy LaRaviere, below], most of whom were off-the-record. CPS Chief Executive Officer Forrest Claypool has tried to put the burden of the cuts on the principals, while ignoring his expansion of the so-called "Networks" and his own personal "leadership team" [documented elsewhere at Substance]. The actions began at the Bank of America Chicago headquarters building on LaSalle St. Following a rally, some of the protesters engaged in a sit-in. According to police and the CTU, 16 were arrested. The actions then went down Wells St. to Congress Parkway, where they blocked the expressway. Then they returned for a rally at the Daley Plaza, where the actions finally ended. Speakers at the Daley Plaza event stood on the famous Picasso statue and talked about the issues facing teachers, parents, and students. One student was heard saying "The old people are getting tired" after the events had marched and rallied for more than a mile. By 6:30 the actions of the day were over. CHICAGO-Two days after Mayor Rahm Emanuel's handpicked Chicago Public Schools (CPS) CEO Forrest Claypool declared war on public school educators by threatening $100 million in classroom cuts-roughly 1,000 layoffs-and the removal of teachers' long-standing pension pick-up, the Chicago Teachers Union (CTU) will continue a series of non-violent direct actions with a mass march and rally from Bank of America (BOA) to City Hall today at 4:30 p.m. While many of the marchers on February 4, 2016 carried home made signs, banners and other signs at the marches noted that Rahm Emanuel's attack on the city's public schools have been clearly in support of Rahm's banker friends and the ruling class he represents. Marchers were also reminded ("Support our schools. 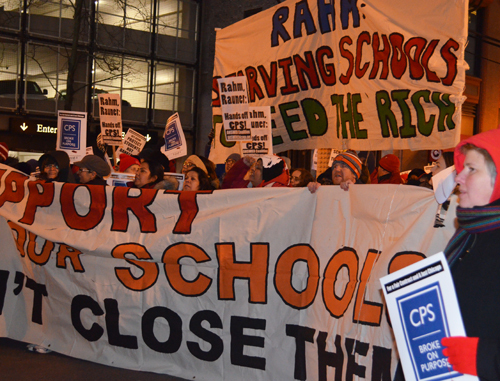 Don't close them") of Rahm's 2013 attack on the city's real public schools, the closing of 50 schools by Rahm's Board of Education in May 2013. Also noted by many of the marchers was the fact that the man who drew up the list of schools to be closed was Frank Clark. After the scandal eliminated Barbara Byrd Bennett as CEO of CPS, Rahm made Forrest Claypool his fourth choice for the job of CEO -- and Frank Clark was appointed President of the Chicago Board of Education. Substance photo by Sharon Schmidt.Yesterday, the CTU withdrew nearly $1 million from its BOA account in protest of that bank and other financial institutions that sold CPS toxic interest rate swaps and are demanding a payout of at least $228 million-almost the exact same amount as cuts enacted by the Chicago Board of Education to schools and special education. In total, the City of Chicago and CPS will lose $1.2 billion on these toxic swaps, despite the CTU asking the Board for years to be a partner in challenging these rip-off deals. WHEN: Thursday, February 4, 2016. 4:30 p.m.
WHERE: Bank of America, 135 S. LaSalle St.
WHY: Mayor Rahm Emanuel has had every opportunity to pursue revenue from his wealthy friends and backers. Instead, he has targeted educators and students to pay for the Board's mismanagement. Today, Chicago's educators and public school supporters take to the streets to continue their fight for the city and the schools Chicago's students deserve. During my career as a Chicago Public School principal, I have often been at odds with the Chicago Teachers Union. I have been the target of multiple grievances filed by CTU against me when I have disciplined or dismissed a teacher. All were signed by Karen Lewis, and I fought most of them vigorously. Given that history, you might think it odd that I support several CTU stances. However, I believe in a simple truth: When you�re wrong, you�re wrong; and when you�re right, you�re right. Unfortunately, our mayor and his appointed board of education have been so irresponsible and so reckless, that I find myself squarely in agreement with the CTU on several school issues. When they�re right, they�re right. Furthermore, during the latest contract negotiations, I have come to the conclusion that CTU�s refusal to accept the Board�s last contract offer gives the residents of Chicago the best chance we have to fix the causes of CPS� financial crises. The continuation of the negotiations gives the CTU an opportunity to clearly and repeatedly articulate the real causes of CPS� financial problems to Chicagoans, and to challenge us to hold our officials accountable and ensure they do not repeat their failures. He did not add programs without identifying additional revenue to pay for them. He did not borrow for operational expenses. He did not spend on new schools when there was declining enrollment. Building new schools should be based on demographics, not school reform ideology. He did not redirect funding for pension payments toward other spending projects. After Vallas� departure, the mayor�s appointees to CPS lost all fiscal discipline and consistently violated every one of these sound budgeting practices. As a result of their mismanagement, CPS now claims they need �shared sacrifice� from teachers. Teachers union officials don�t seem to have the kind of consistent and concise messaging the Mayor�s office has, so the average news consumer may not notice that within CTU�s response are the keys to solving CPS� fiscal crisis. I will take the liberty of fine-tuning CTU�s message and speaking as the Chicago public school teacher and union member I once was, before becoming an administrator nearly a decade ago. First: The taxpayers of Chicago must know we have sacrificed. CPS effectively cut teacher salaries for four years in a row when we allowed them to default on pay raises that were in the CTU contract. If costs go up, and your salary stays the same, then your pay has effectively gone down. Teachers accepted that pay freeze and they saved the district more than half a billion dollars by making that sacrifice. Second: Not only have we made sacrifices in the past, but we completely agree with the district�s call for more shared sacrifice. The key is that it must be shared�shared with the parties responsible for this fiscal crisis. CPS was knowingly, and illegally, lured into loan agreements that cost them hundreds of millions in fees, penalties and interest. Teachers did not do this. We will accept the mayor�s call for us to sacrifice when he calls for Bank of America to sacrifice. We will accept his call for teachers to sacrifice, when he calls for the Royal Bank of Canada to sacrifice. Mayor Emanuel could sue these institutions to get taxpayers� money back. Thus far, he has refused. His call for hard working teachers to endure more sacrifice cannot be respected or taken seriously until he forces those who caused and profited from this fiscal crises to sacrifice as well. In short, we will accept shared sacrifice, when it�s actually shared. Third, and finally: We would be happy to sign a contract with CPS that ensures we will not end up in this same crisis in the future. Accordingly, the contract must include provisions that force CPS officials to exercise discipline with taxpayer money; provisions that emphasize intelligent new school construction policies, revenue generation, sound borrowing practices, responsible payment of legitimate debts, and recoupment efforts for illegitimate losses. In summary, (1) Past teacher sacrifices have already saved the district more than half a billion dollars, (2) We are willing to engage in additional shared sacrifice, so long as it is shared, and (3) We will protect students and taxpayers by using these negotiations to ensure future fiscal discipline by CPS officials. That is what we�the teachers of Chicago�are standing for, and we are asking all Chicagoans to stand with us. For too long we have allowed CPS and City Hall officials to distract our attention away from their incompetent management of CPS finances. They channel public anger toward our children�s teachers when our attention should be focused squarely on those whose recklessness created this crisis: CPS & City Hall officials, along with their allies in the banking and finance industry. We must support our teachers in their call for true shared sacrifice and sound financial practices by our elected and appointed officials, and we must acknowledge the sacrifices these teachers have already made. Please join our teachers by challenging CPS� false and incomplete narrative at every opportunity and demanding fiscal discipline and accountability. Sign CTU�s petition against Bank of America and withdraw any money you have in a BoA account. Please focus your attention on bringing the appropriate parties to the table to share the sacrifice with our teachers. You can start with Bank of America, the Royal Bank of Canada, the Pritzker Group, Goldman Sachs, Northern Trust, and any number of the top Emanuel campaign contributors who have profited from our tax dollars. Be responsible financial stewards of our school district by adopting�in writing�the sound fiscal practices described above, and stop scapegoating our teachers for the financial recklessness of the mayor�s appointees. Click one of the share buttons below to share this article with your circles. Gillers, Heather & Grotto, Jason (November 10, 2014). Banks Kept CPS in Shaky Bond Market. Chicago Tribune. Vallas, Paul (August 25, 2015). Remarks at the City Club (Video). [Relevant section begins at 36:10 point of the video. Also contains remarks by Jesse Ruiz, Troy LaRaviere and Chuck Burbridge]. Andrzejewski, Adam (March 25, 2015). The Moral Bankruptcy of Chicago�s Elites: As the City Approaches Bankruptcy Chicago�s Elites Line their Pockets with Taxpayer Money. Forbes Magazine. Chase, John; Coen, Jeff & Ruthhart, Bill (January 30, 2015). Rahm Emanuel Counts on Big Donors, with Many getting City Hall Benefits. Chicago Tribune. Chicago Tribune Editorial Board (July 2, 2015). CPS: Stop Blaming Springfield. FitzPatrick, Lauren (March 25, 2014). CPS Wants to Spend $10 Million on Office Furniture. Chicago Sun-Times. Joravsky, Ben (December 3, 2014). How Investment Bankers are Set to Profit from Rahm�s Preschool Plan. Chicago Reader. Grotto, Jason & Gillers, Heather (November 7, 2014). Risky Bonds Prove Costly for Chicago Public Schools. Chicago Tribune. It will be interesting to see what strategy the CTU will take in regards to the boards demands of accepting a contract by March 2 or face losing their pension pickup full payment. If the CTU strikes, what reason will it be for? To fight for preservation of the pension pickup even though union leaders attempted to forgo it in the defunct contract proposal or strike but turn around only to forgo and eventually give up the pension pickup, thus making a strike pointless. The only hope the board has to entice CTU members is to reduce the elimination of the pension pick up and split it down the middle to 3.5% with fixed healthcare cost if theres a chance. If not this is the 1980 strike all over again with CPS claiming broke and the mayor, state and other power brokers getting involved. Jessie Sharkey is doing his duty as Vice President.